From Manila, I took the second morning flight to Cebu and at past 7AM, I had already made my way out of Mactan International Airport(book flights here). Normally, my first agenda when arriving at a destination is to eat but after two months of no hiking, I couldn't wait to hit the trails! There are motorbikes near JY Square in Brgy. Lahug in Metro Cebu and the drivers are pretty familiar with Sirao Peak. As an alternate, you can take a van to Balamban from the terminal at Ayala Center. I boarded the one flagged by my cab driver who I chatted earlier in broken Cebuano which I've been trying to learn for the past couple of months (proud moment right there :P). Passing the scenic Transcentral highway in Balamban, a steep, winding road that goes around a mountain, the ride to the jump-off turned out to be 30-40 minutes short but very exciting. Welcome scenery at the trail head. From the highway, the driver turned to a smaller road and stopped. He started talking again in Cebuano. I only picked up a few words but I understood the directions to the peak. From what I know, it shouldn't take more than 30 minutes to get there. The single track trail I followed led to a fork and each trail led to another fork. To avoid getting disoriented, I made it a point to look back every time I passed a fork so I'd remember what it looks like going back. I could still hear the sound of vehicles from the main highway - which in a way was comforting for a solo hiker. 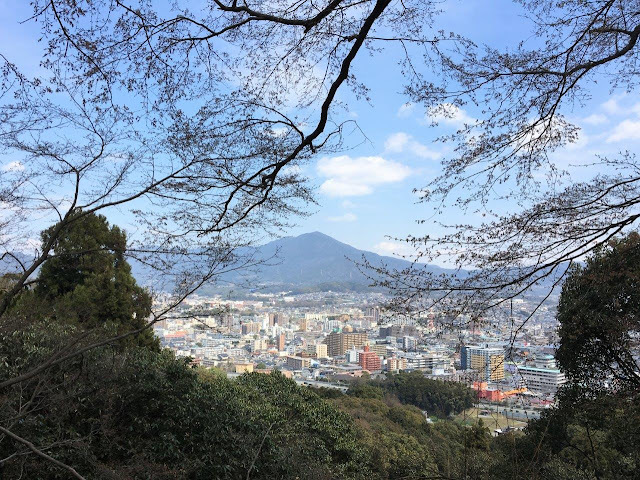 After climbing up what appeared to be the highest point, I found the trail that led to the view deck which I totally missed on the way up. 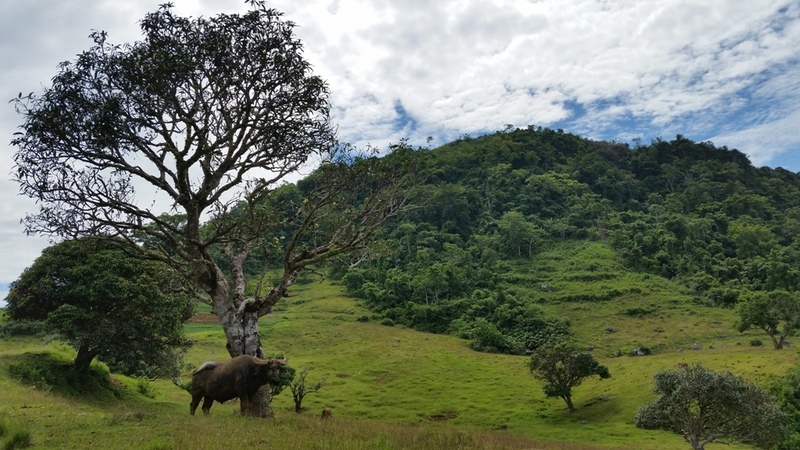 This enormous area considered as the summit campsite offers views of Metro Cebu, Mactan and other mountain peaks. 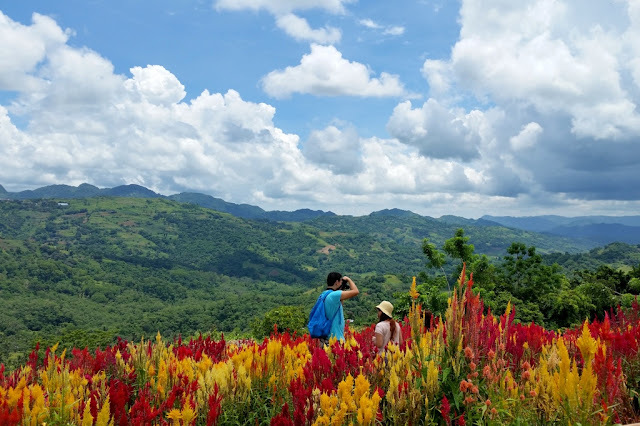 After enjoying the fresh air and the view, I went back to the jump-off and walked about 400 meters to Sirao Pictorial Garden & Campsite (Entrance fee : 25 Pesos), the second attraction in the area featuring Celosia flowers. The first one, Celosia Flower Farm is a little farther down the road. Manang, the lady at the gate was very friendly and offered me a bouquet of roses for only 50 Pesos! Gah, if only my hotel room had a bathtub, I would have bought it and soaked in rose petals! Hehe! There was a motorbike just across the garden's entrance which I rode to get back to Lahug. Lunch was at Ding Qua Qua, a Chinese restaurant at the second level of JY Square mall. The waiter recommended that I avail of their buffet so I can save money. I laughed inside. An ala carte meal can cost as little as 150 Pesos which is enough if you're not a hefty eater, while the lunch buffet is at 248 Pesos net. Whatever made him think I won't get satisfied with an ala carte meal? :P Seriously though, I was grateful for the suggestion. Getting an unlimited serving of dimsum and steamed fried rice pot (must try!) certainly made up for skipping breakfast! The quickest way to get to Cebu from Manila is by taking a plane. During airline seat sales, it may even be cheaper than taking a boat. A boat departing from the port in Manila takes 22 hours and costs around 1,400, one way via 2GO. Boat schedule here. Budget airlines Cebu Pacific, Air Asia and the flag carrier Philippine Airlines flies to Cebu from Manila. Air Asia departs from T4 in Manila which has been renovated. With its numerous dining establishments, clean restrooms, I find it really nice to fly out of Manila from T4 then take a flight back to Manila via Terminal 3 where there are more cabs (where Cebu Pacific lands). How to Get to Cebu City from Mactan International Airport the Cheap Way? If you're not in a hurry and not carrying too much, take a MyBus, a public aircon bus stationed at the arrivals area near the exit gate. Fare is 25 Pesos and drop-off is at SM Cebu. Trip schedules are from 7:00 AM to 9:00 PM, with a 30 minute interval in between. Going back to the airport, you can take the same bus from the terminals at SM Cebu or SM Seaside. Waiting time is around 30 minutes. From JY Square Lahug, I rode a motorbike (also called habal-habal) to the jump-off in Busay near Ayala Heights. Fare is 100 Pesos. As of August 2016, there are no registration fees to be paid. Just tell the driver you're going up Sirao Peak. 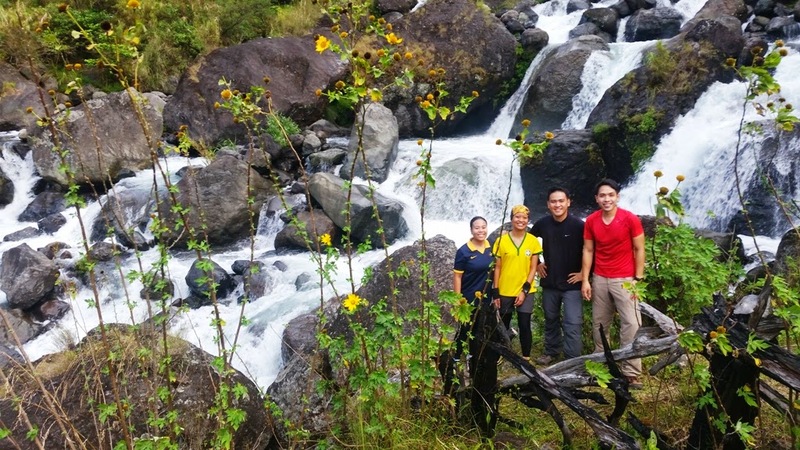 There is a longer and more challenging trail via Barangay Budlaan in Talamban, Cebu that passes Kabang Falls that takes 6 hours. Details here. 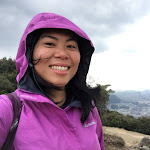 For information on other hiking destinations in Cebu, check out this post from Pinoy Mountaineer. Another helpful site is Adrenaline Romance, owned by Cebu-based hikers, Sheila and Gian. 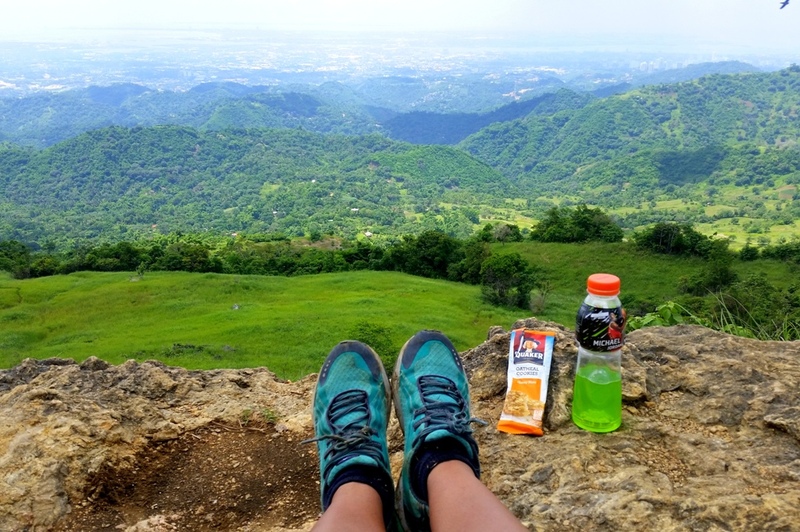 Where to dine after your hike? Price : 248 Pesos net/head. Drinks not included. *I was able to snag a nice room at a cheaper rate (922.05 Pesos/night) which I booked through Agoda, link here. Cebu Pacific Awards Young Travelers in Juan For Fun Backpacker Challenge 2016! Like any supportive fellow traveler, I was delighted when I learned that Cebu Pacific has been organizing its own travel challenge. Now on its fifth year, the Juan for Fun Backpacker challenge gives younger people from different universities, a chance to discover what their home country has to offer. For seven days, 5 teams explored and experienced the Philippines following an itinerary they created with a travel allowance of 35,000 Pesos. The challenge alone feels like a prize already! But you know what's even more amazing? The winning team gets a Travel-All-You-Can pass! Each member of the winning team will be able to book as many free flights as they want to any domestic and international short-haul destinations within one year. They also got to take home gift certificates from Cebu Pacific’s partner brands: Tripologie travel store, Merrel shoes, and Boreas travel bags. Placing second was #JFFTeamPura, composed of Marie Tuason, Karlo Carranza, and Samantha Rice. 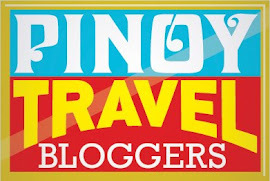 Their itinerary covered Bohol, Cebu, Dumaguete, Siargao, Iloilo, and Davao. Their energetic adventure coach was Bogart the Explorer. 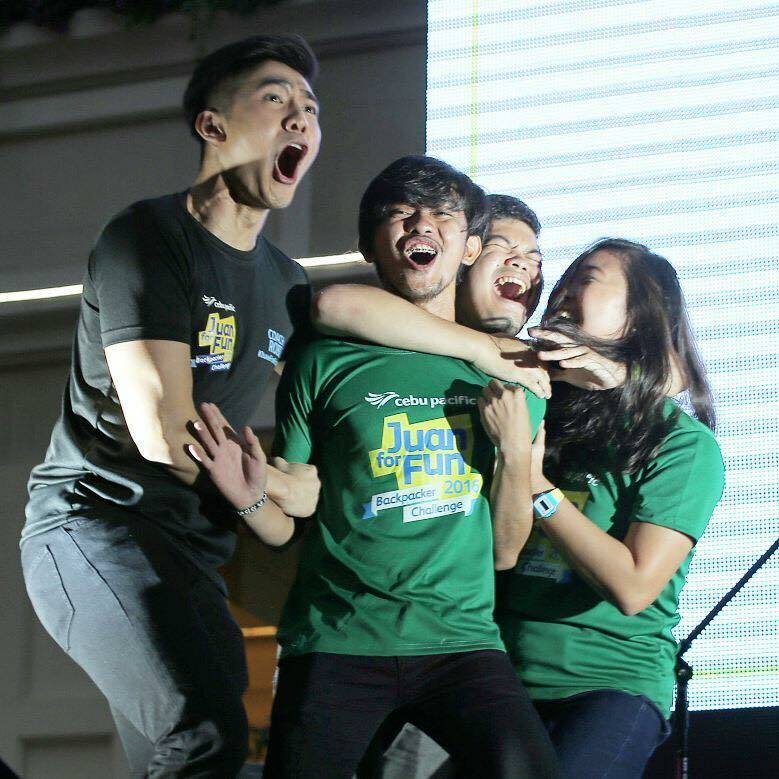 In third place, group of friends #JFFTeamWork, Serge Calumpong, April Nacion, and Jaysson Presores. 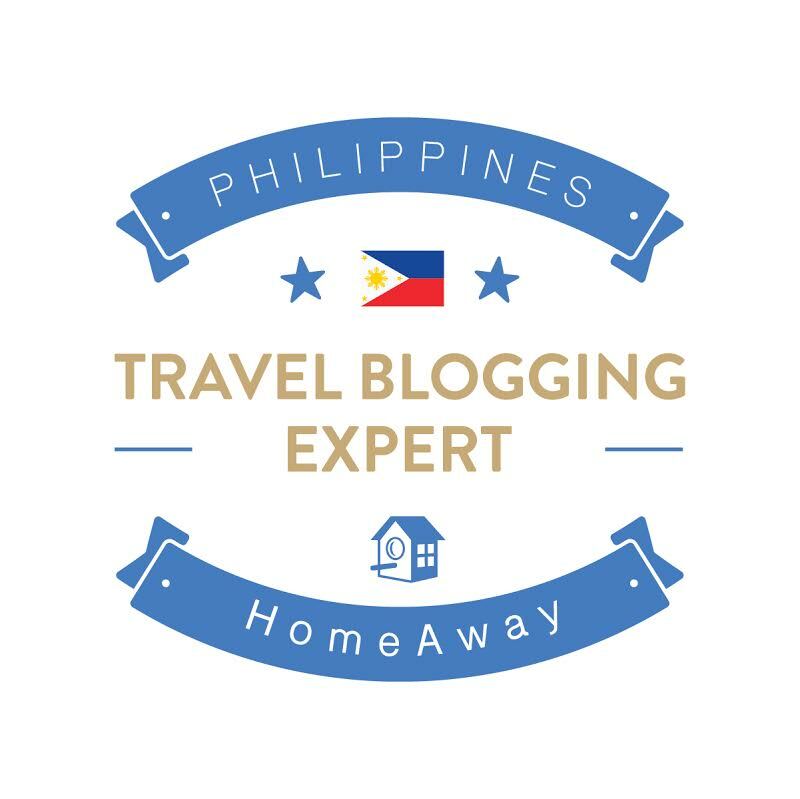 Together they explored Laoag, Cebu, Bacolod, and Davao. Their adventure coach was travel writer Jude Bacalso. Tied at fourth place was #JFFTeamPablo and #JFFTeamTAG. The former is comprised of Brendan Tangan, Linus Pagulayan, and Cherson Bariuan from St. Paul University Philippines. JFFTeamPablo's enjoyed Coron, Camiguin, Iloilo and Cebu. Their adventure coach was Saab Magalona . #JFFTeamTAG’s Tricia Quintero, April Baldovino, and Gian Nicdao of University of the Philippines-Manila headed to the country's popular destinations, Boracay, Cebu, Iloilo, and Puerto Princesa, Palawan. Their adventure coach was musician Champ Lui Pio, who performed a couple of songs during the awarding. 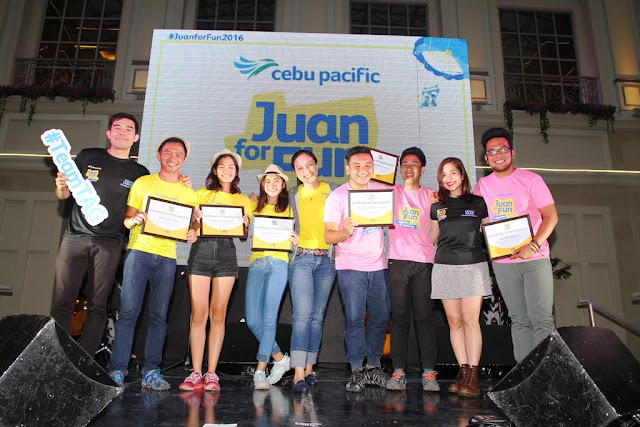 Cebu Pacific Juan for Fun Backpacker Challenge 2016 has Boreas Gear as the official travel gear, Merrell as the official footwear, and GoPro as the official camera. The challenge is also supported by Wenger and Dan’s, and endorsed by the Department of Tourism and Commission on Higher Education. Note : All photos used in this post are from Stratworks.